Please also read [#A Bit More Elaboration], just beneath "Public Notice". long as I'm not an "active member" on Elftown.com AND THIS is MY decision to make, NO ONE else's, INCLUDING the site owner's!!! and use of MY works either! He may own the server and domain, but he does NOT OWN MY WORK! the former vice mayor's own "publicly made statements". conceals evidence, does so because they have something to hide. everyone who called me to think that my phone was not working, that it had been disconnected, and.. this lasted for three weeks! ..And I have a TON MORE DATA collected implicating him with phone tampering and computer hacking! simply because I refuse to comply with his wishes so he can keep his 'secret activity' a secret! me for HIS wrongdoing. I'm not looking for pay back, but just that things get resolved and done so that would be "mutually beneficial"
removed it, PLEASE STAND UP!!! HE knows who HE is! "As soon as a creative work is created, the work "BELONGS TO ITS CREATOR". - the creator/owner relinquishes his/her rights by agreement/contract with another or others. - places their work into "public domain". 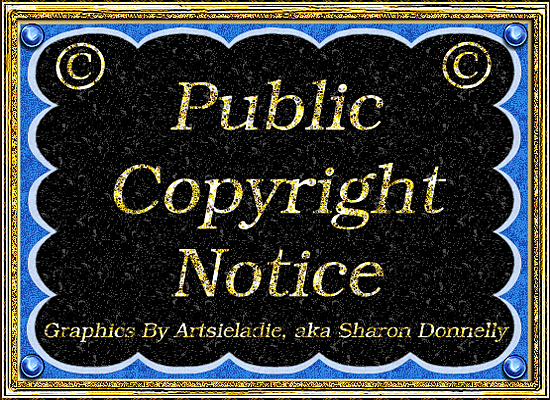 Unless modified ONLY by Artsieladie, aka Sharon Donnelly, [Galadriel], copyright owner. terminates said agreement, completely and immediately. Text ONLY emails! NO attachments! NO hyper-links or urls of questionable origin. Non-compliance means deletion! Note: The ones marked with an * are the ones I check most often. ~ Someone just "assumes" they can do with MY creativity as THEY wish without even asking me. ~ Someone just takes my creativity and modifies it and then claims it as their own. ~ Someone just steals it period and claims it as their own. ~ Someone uses it WITHOUT giving me the credit and/or removes my name as being the creator. ...and I may add more. Note: The ones marked with an * are the ones I am on almost always. All creativity on this page is copyrighted to Artsieladie, aka Sharon Donnelly, aka [Galadriel], unless otherwise specified. All rights reserved.